The answer is simply that I make a conscious effort to eat a variety of the large number of meat alternatives on the market. These range from beans to certain vegetables and also fake meat products such as Morningstar burgers (not associated with the investment research company). Once you start looking at all of the meat alternatives available at both grocery stores and fast food alike, it becomes easy and makes sense to incorporate them into an everyday diet. I think of investing similarly. Many times, we must go on a “diet” from a certain asset class and look for alternatives to generate return. After looking beyond traditional equities and fixed income, we find that there are many other asset classes that can provide us the protein that our portfolios need. By definition, these assets are generally less liquid, have less transparency and may be subject to different tax treatments than traditional assets. These characteristics all sound negative, so why would anyone want to gain exposure here? The answer is that these assets have historically low correlations of return to traditional assets, which help to mitigate portfolio risk. As you know, here at CLS we are all about controlling, measuring, and stabilizing risk. The correlation of these securities to traditional asset classes is less than one, meaning that they will not move directly in line with the market and therefore provide downside protection as well as opportunities for outperformance. 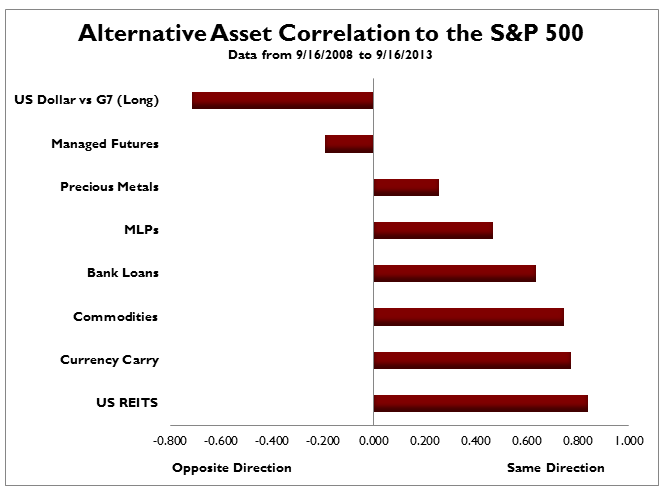 Correlations can be measured anywhere from 1 (assets will move perfectly in line with one another) to -1 (assets will move opposite of one another). Taking a look at the table below, we can see that while each of these alternatives deviate from the moves of the S&P 500, there are still large differences in correlation between each of these classes. Finding an asset class that can outperform during a down period can also be used to generate excess returns within a portfolio. For example, broad based commodities and precious metals both outperformed last month, the former returning 3.38 percent and the latter 7.87 percent over the month of August. Just as it makes sense for me to eat healthy, low-fat meat alternatives, it also makes sense to include alternative asset classes into my investment decisions knowing facts like these. When these alternative assets outperform, it is easy to understand the benefit of including them into a portfolio. However, in periods of time when nearly everything trails domestic stocks, it can be hard to remember why we bother to make these allocations. Investors must remember that the market is fickle. The asset classes that have seen growth recently oftentimes won’t continue, and so it is best to spread out your eggs and receive steady yields rather than placing large bets and chasing performance. Utilizing alternative asset classes in our portfolios helps us to provide clients with the protein of steady risk and return that they are looking for.